EQuAMA is an association that aims to improve the management, promotion and animation of the European Quarter in Brussels. Acting as a laboratory, EQuAMA is testing new ways of using public space and wants to attract users and visitors to lively, animated public spaces. EQuAMA will gradually transform public spaces into Urban Lifestyle Points (ULP) by thinking, creating and making the space live. This association called upon the creativity of Talking Things (design agency) to help imagine tomorrow’s public space of the European Quarter. Talking Things developed an urban strategy based on an experimental approach by testing lightweight and compact urban furnitures or micro-architectures. “European Quarter Lab’ proposes to test new ways of using public space by building a critical platform consisting of citizens, users, politicians, scientific people with a critical regard in relation to the desired future European quarter. The challenge consisted in proving that the quality of the European Quarter also lies in the variety and proximity of several actors and the fact that they share a common space. This notion of sharing was introduced by designing an urban furniture. A first design was conceived for the public spaces in the European Quarter. The experimental element consists in playing with the options of sharing a giant table and how this furniture can interact with the different public spaces. The 70 tables are mobile and their place and shape are change in order to test new way to improve the public spaces. 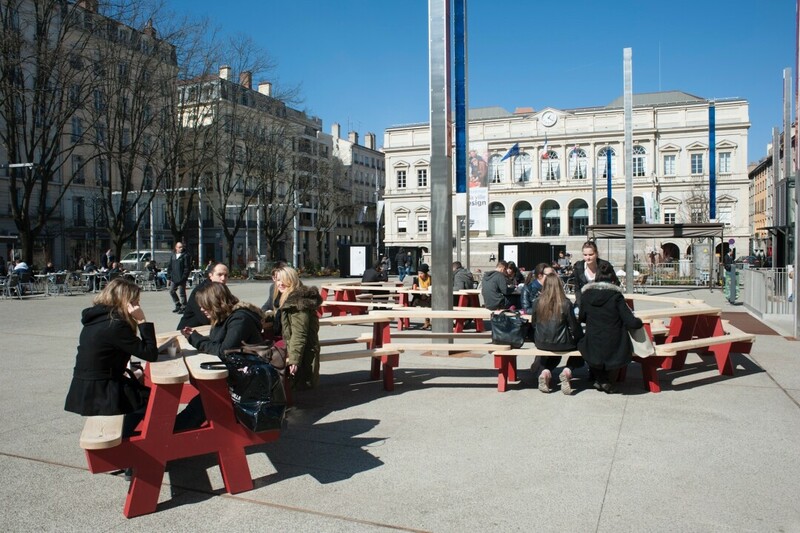 • The Cité du design and the City of Saint-Etienne launched a call for urban furniture in public spaces tested during the Biennal International Design Saint Etienne 2015. • « European canteen » is a project initiated by ASBL EQUAMA and developed by Talking Things to improve quality of public spaces Brussels’ European quarter. • City of Saint-Etienne gave financial support to this project, provided equipment, authorisations, staff and technical support. Municipal carpentry department produced the furniture in the framework of “Banc d’essai” call for the Biennale Internationale Design Saint-Etienne 2015. • Design explicit: “European Canteen” is composed of simple modular tables allowing a thousand ways to create a public canteen in a park or to be settled next to a foodtruck. The simple and easy installation (4 screws per table, less than 30 minutes to build a table for 50 person) allows several options from neighbourhood event to collaborative montage with residents, associations and city actors. • Public space : Main issue = Adapt a table model originally designed for urban parks to a new urban environment : a mineral public square. • Co-design: Municipal carpentry staff produced tables from a pattern designed by Talking Things. After a first prototype, “European Canteen” designers went to the municipal carpentry workshop to check look, resistance (cement legs, wooden boards) and ergonomic shape of the table. Changes have been made and then manufacturing process had been launched. Also in-house solutions had been founded to produce a two-template mould for a better efficiency.